Unfinished Basement to Industrial Home Gym on a $100 Budget - Lovely Etc. 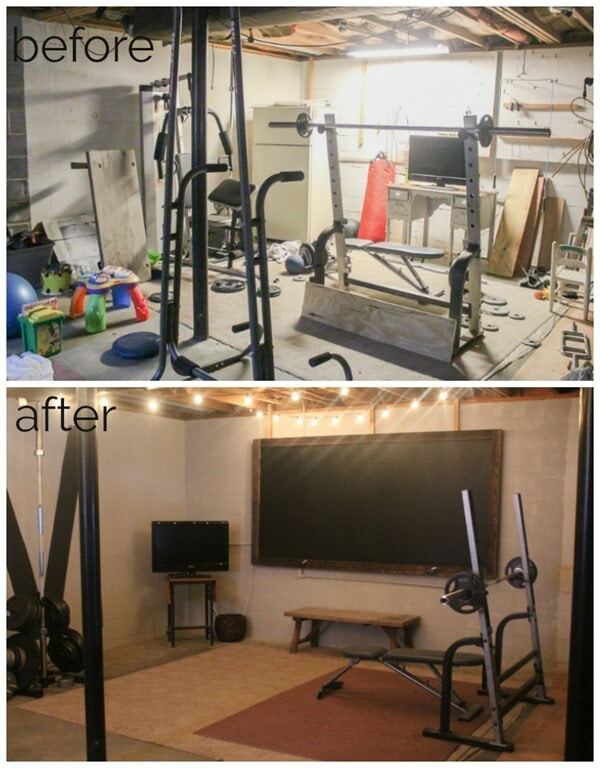 I’m so excited to share our $100 basement home gym today! 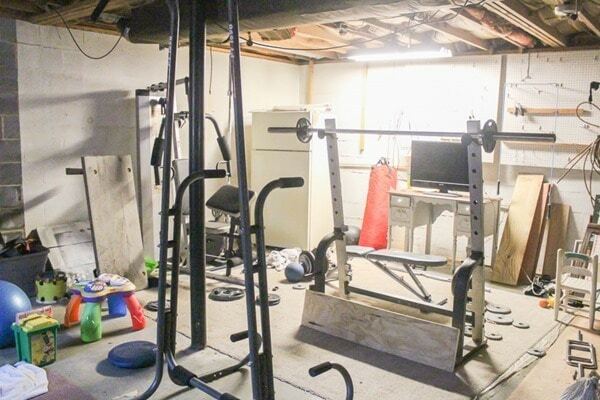 For the past four weeks, I’ve been busy transforming part of our dark, creepy, unfinished basement into a clean, useful home gym with an industrial flare. As if that wasn’t difficult enough, I took this project on for the $100 Room Challenge. If you don’t know, the $100 room challenge is a challenge started by Erin from Lemons, Lavender, and Laundry to make over one room in your home in only one month with a $100 budget. Definitely challenging! This is my third time taking part in the $100 Room Challenge; last year I made over our main bathroom and our family room and I was so thrilled with what I was able to do in both spaces with my tiny $100 budget. This time I decided to tackle our basement home gym. 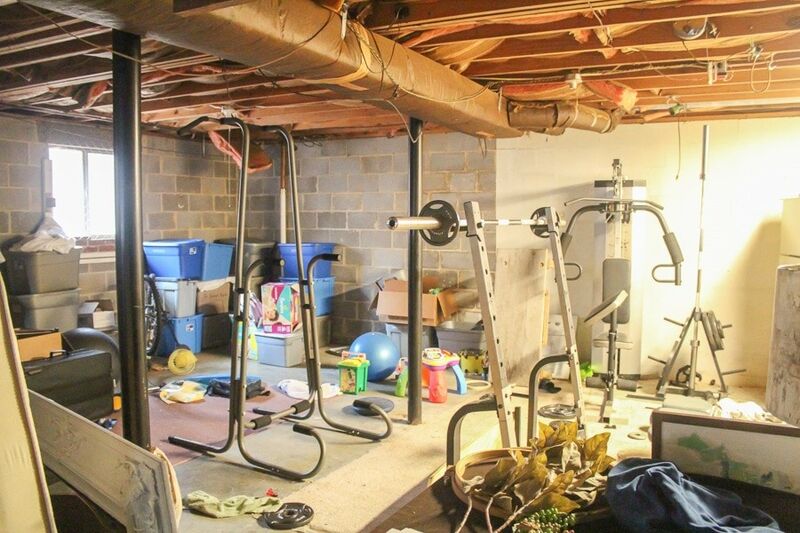 My husband has been using one side of our unfinished basement as his home gym for several years now but it hasn’t exactly been the nicest place to work out. Check out these terrible before pictures. The space didn’t exactly make you want to jump in and start working out. As I shared last week, this wasn’t the most fun space to work on. I spent most of my time down there clearing out piles of junk, prepping cinder block walls for paint, and scrubbing everything down. Not so fun. But thankfully I finally got all of that stuff out of the way and got to add some fun industrial touches. This space has come such a long way! It is much more masculine and industrial than my usual aesthetic but the industrial vibe is perfect for the unfinished basement space. I mean when you’re working with exposed rafters and block walls, I’m pretty sure industrial style is the only thing that’s going to make sense. The huge chalkboard was another DIY project that I will have a tutorial up for soon. It was so inexpensive to make and it looks gorgeous. It’s fantastic in this space but it would also look perfect in a playroom, family room, even a farmhouse style dining room. 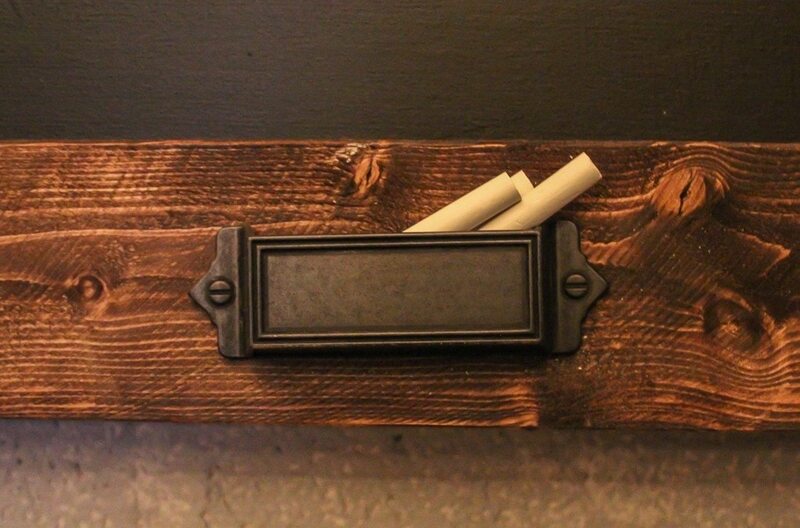 Along the bottom of the chalkboard frame are two upside down bin pulls from to hold chalk. I moved the TV from the girly vanity it was sitting on to this old typewriter stand. The size isn’t perfect but it works. The little basket holds the power strip that the TV and lights are plugged into as well as a small space heater we sometimes use. The typewriter stand and the rustic bench were both things that were already in the basement from previous thrifting adventures. We also already owned the lockers too. I found them a few years ago at a yard sale for only $10 looking rather sad. You can see all the details on their makeover right here. We’ve had them in our master bedroom for the past few years but I was ready for a change in there and I knew they would be perfect in our home gym. The lights were another huge change in this space. Before there was a fluorescent light in one side of the space and a bare bulb hanging down on the other side. 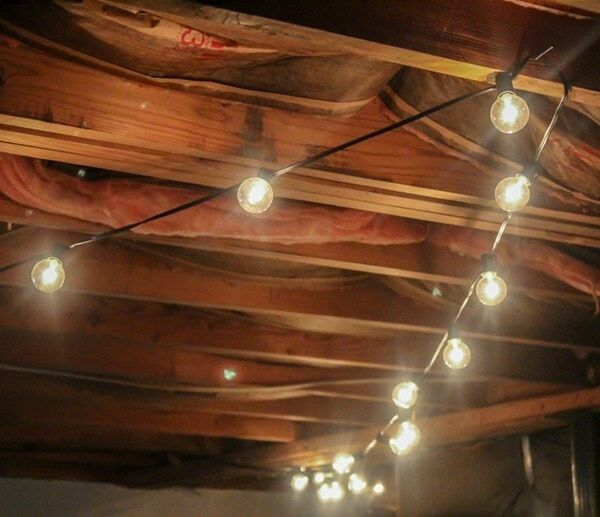 We removed the fluorescent fixture completely and added a 50 ft. string of lights hanging from the rafters. It warms up the space so much and helps make it feel cozy even though it’s still open to the rest of the unfinished basement. I would have loved to paint the exposed rafters as well, but there was already insulation installed so it just wouldn’t have made sense. Of course, it was also important that this space actually works well as a gym. There’s no point in having a nice looking gym if it doesn’t function for working out! My husband was the brainpower behind most of the layout. One half has a large open area with lots of space to move around. There’s also a hook on the ceiling in that area for hanging the punching bag. The other side contains the weight bench and all of the free weights. 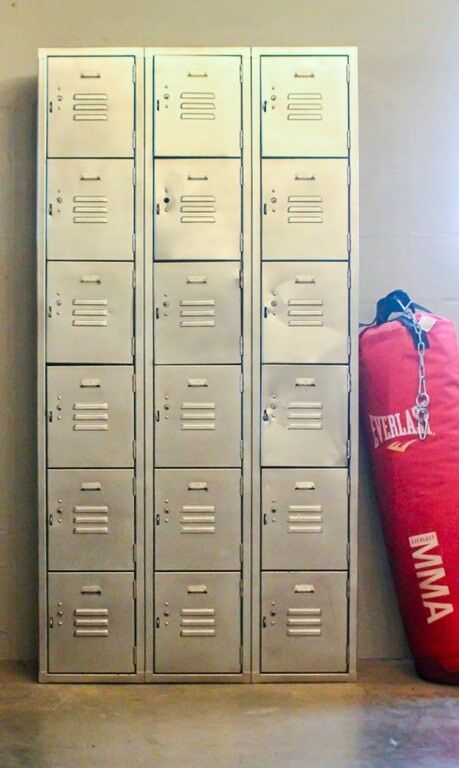 The lockers hold smaller dumbbells, gloves, jump ropes, kettlebells, and other small things. Here are a couple of before and after comparisons. Talk about a crazy difference! Okay, so as always, the big question is did we stay on budget? Well, as I explained last week, we did have to spend $60 on materials to fill the cinder block walls to prepare them to be painted. I’ve decided not to count that in the budget for this makeover. It’s more of a home improvement project that needed to happen regardless and isn’t really specific to the room design. (I go into more detail here if you really care.) So not counting that, here is the budget breakdown for the space. This post contains affiliate links which means if you make a purchase after clicking a link I will earn a small commission which helps keep my blog up and running but it won’t cost you a penny more. Click here to see my full disclosure policy. Woo-hoo, not bad at all! Now I am super excited to see how the rest of the spaces in the $100 Room Challenge turned out. I know there are going to be some amazing reveals! You can see them all using the links below. You did it! Love the huge letters on the wall and the chalkboard. What a great space to workout in. Just the push we all need to exercise! Haha! Thank you Gabby! It is definitely a way more pleasant place to be! Goooood grief this is an awesome transformation!! Love the huge gym letters and looove the string lights. The lockers are the perfect touch, what an awesome thrift find! You’re making me jealous of basements, they’re not very common here in Texas. Great job!! Thanks Molly! The string lights seriously make such a difference in person! This turned out so amazing! 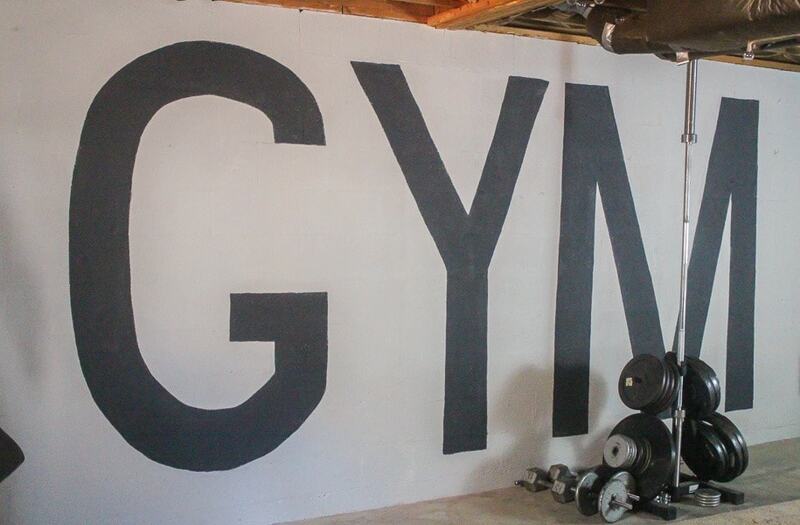 I love the GYM painted on the wall. And it looks like the perfect place to sweat it out. I would love a home gym, but sadly we do not have any unused spaces. Maybe in the next house. Thank you Kati – we are super lucky to have this huge space and I’m so happy we are actually going to use it now! This is such a creative way to fancy up an unfinished basement gym!! I am LOVING those lockers!! Perfect touch!! Thanks so much Rebecca! Those lockers were such a lucky find – you should have seen me trying to fit them in my SUV to get them home though! This is just incredible! It probably is so more motivating to work out in that space! Awesome job! Thank you! And yes, definitely more motivating! Carrie!! You did a fantastic job on this makeover. And can I just tell you I was practically drooling over those lockers and then shocked that you scored those for $10 at a yard sale!! 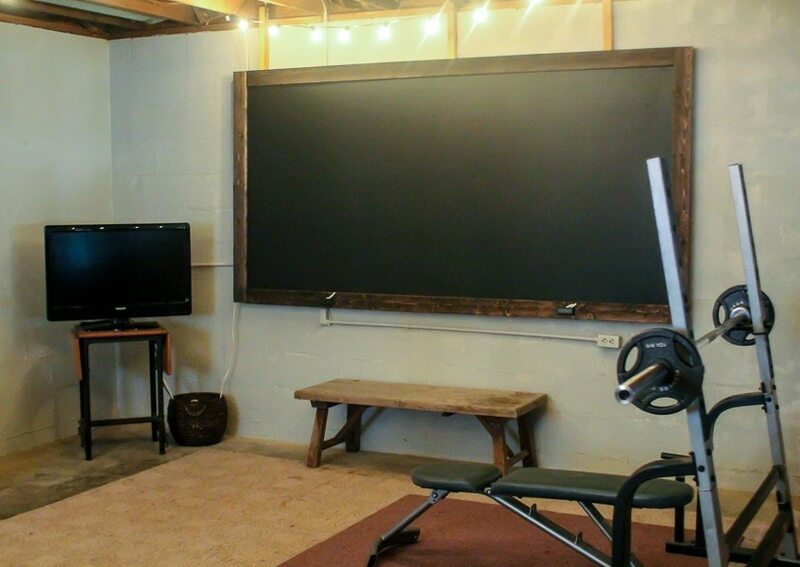 And I can’t wait to check out that DIY chalkboard – it’s so perfect in there! Great job and this would motivate me to exercise! Thank you so much Melissa! The lockers are definitely one of my favorite thrift finds ever! And I love that chalkboard – I would love to have one in another part of our house if we had the wall space! Wow! You made an unfinished basement look good! Even with insulation in the rafters! You just gave me to much hope for my own basement. Thank you Emy! I’m glad I gave you some vision for your own basement – I’m really starting to brainstorm some more things we can do in our basement other than storage. Maybe somewhere to send our boys to let off steam?! I am so impressed! This is a HUGE improvement, and I bet your husband loves it. I love the lights, the chalkboard and all the little touches that make it fun and cool. You just proved that even a home gym is worth the time and effort to make it look nice! Thank you Meredith! I definitely think any space that is worth having can be fabulous with a few creative touches! Wow! those before pics…priceless. for sure looks like a fun place to workout. Love how you embraced the industrial look. It’s perfect. Thanks Kelli! This was definitely the perfect space for the industrial look – and it worked so well! PS. Good improvement, Carrie :) Love it!! Thank you so much Varsha! I cannot believe how different this space looks now! 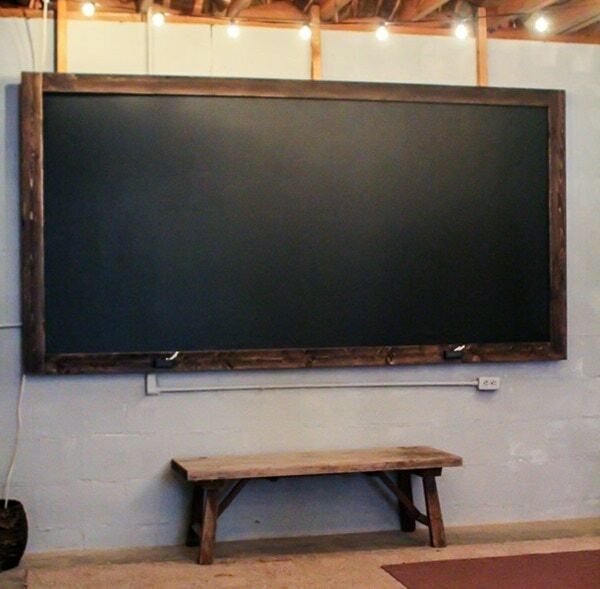 I love that huge chalkboard (and the brilliant idea of using upside down pulls for the chalk). The lockers are perfect down here… and it all just looks so clean and ready to go. Another amazing room done! Thanks for joining in another round of the challenge! Thanks Erin! I’m so thankful for this challenge – so many spaces in our home are finally living up to their potential! What a difference! It looks great! 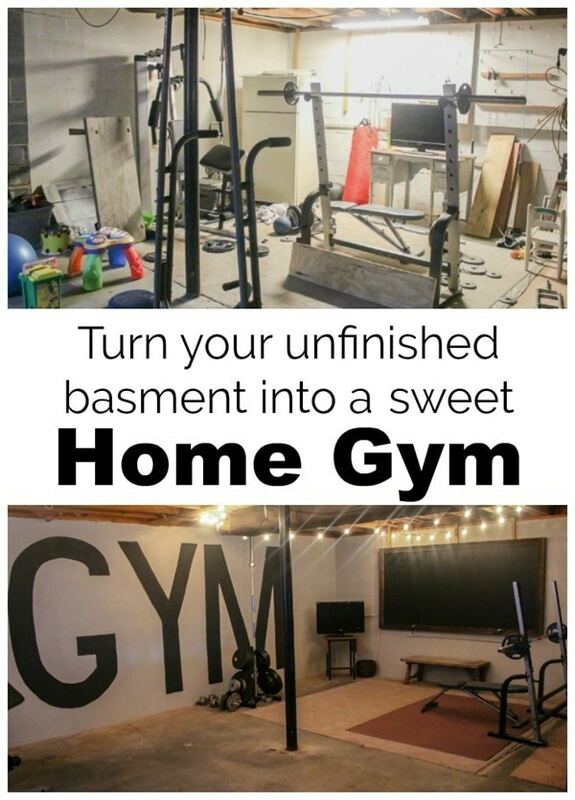 We want to do a Home Gym space in our basement too. Definitely pinning for inspiration later! What a transformation! I’ve been wanting to do this in our basement and this may have just given me the push I needed to actually get it done. I love it! How nice to have a home gym! I love the letters on the wall and that pretty chalkboard! I love the painted walls. They make all the difference. And a great idea to put in a chalk board! Love it! Thanks Wendy! It really is amazing what a fresh coat of paint can do! DRASTIC improvement!! Seriously, your husband has to love this makeover. I love the GYM painting idea. Thank you Ashley! He does love it and has even been taking his guitar and coffee down there Lol. What a huge difference! 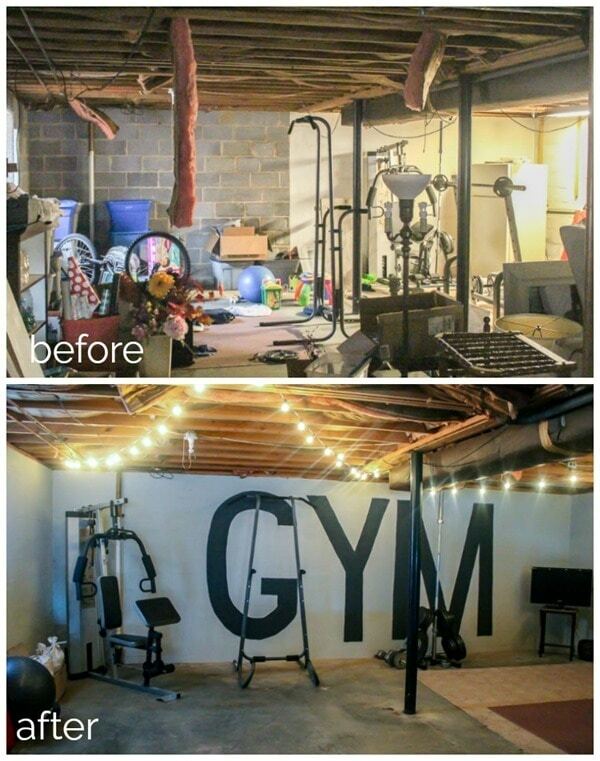 THe industrial vibe is perfect, and I LOVE how you painted “GYM” on the wall – looks so cool! This is stinking awesome!!! I might even work out in there. Your chalkboard is so great as well. The bin pulls for the chalk is genius! I am going to remember that one. Thanks Jessica! Those bin pulls may be a small detail but they are one of my favorite parts too! What a difference! Looks great! The lettering on the wall is a cute touch. I’ve been so looking forward to this reveal and you did not disappoint! I love the oversized letters and just the whole industrial vibe of the room. I half expect to hear Eye of the Tiger playing in the background! Right about now I’m kicking myself for making my husband take his punching bag down.. :) Great job! This turned out great! Everything is so organized and functional! I’m sure it’s a great space for working out now! I love your chalkboard idea! I have a chalkboard on my list of potential 2018 ideas and the chalkholder idea is great! Congrats on a great new space! Thanks Morgan! I really love that chalkboard too and it was so inexpensive to make! Looks fantastic. What’s the flooring that looks like cork? Do you have a tutorial of how you did the chalk board? I don’t have a tutorial for this and I really should! I’m going to work on getting that up ASAP. Thanks.